Saturday, 14 December 2013: Two Hundred and Fifty Seven Days Old. 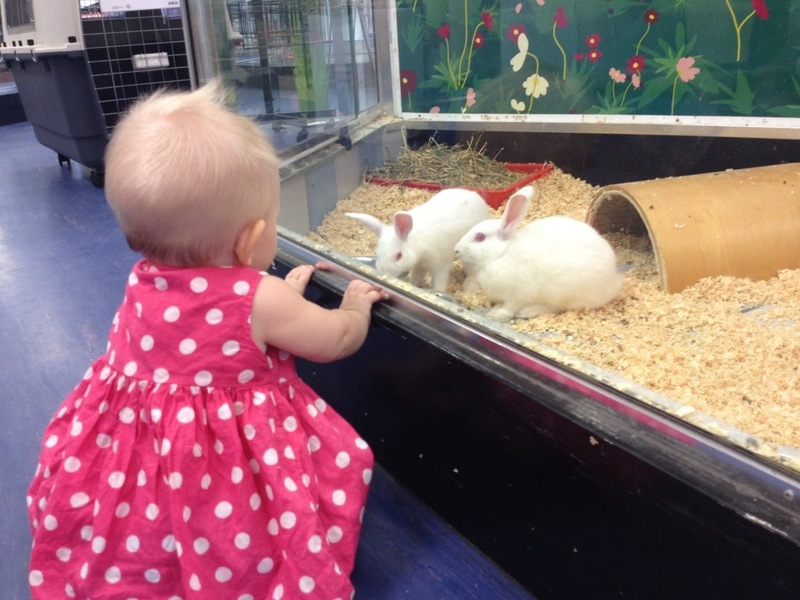 I took Ayla in to a pet shop today and she thought all her Christmases had come at once! Ayla’s head was on a swivel and I thought it was going to fall off her shoulders as she looked around at all the bunnies, kittens and guinea pigs. I sat Ayla down at one of the bunny enclosures to let her get a closer look (a give me a moments reprieve from holding a squirming child) and she just couldn’t get enough! I tried to get her to take her eyes off the bunnies and look at me for a photo but she wouldn’t have a bar of it… And Ayla LOVES photos! Oh! I almost forgot, as soon as Ayla saw the bunnies she started clicking! I don’t know if it was a happy reflex or if Ayla thought they were tiny white ponies, but it was adorable! We couldn’t stay in the shop for long so we didn’t make it to the aviaries or the aquarium but I’ll definitely take her back soon, hopefully with Daddy in tow!